"Your favorite pork cuts threaded on a skewer." Thread 1 end of a piece of bacon onto a skewer; add a ham cube and fold bacon over the ham through the skewer. Add a piece of sausage and fold bacon over sausage. Repeat with remaining bacon, ham, and sausage. Spread bacon, ham, and sausage out onto the skewer so bacon isn't squeezed too closely to the meat. Bake in the preheated oven for 15 minutes. Combine barbeque sauce and grape jelly in a microwave-safe bowl; heat in microwave for 30 seconds. Stir sauce and brush over skewers. 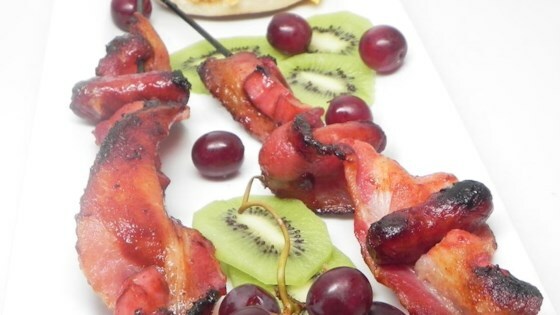 Continue baking skewers, basting every 10 minutes, until bacon is desired crispness, 15 to 30 minutes more. Breakfast and pizza lovers unite! Quick, simple and delicious. I omitted the ham and sauce and jelly, and used Cherrywood smoked, thick cut bacon and Lil smokies; it was a hit!